Join as an Expert. You'll be in Good Company. Scroll this page down to choose benefits. Take action -- be included today. 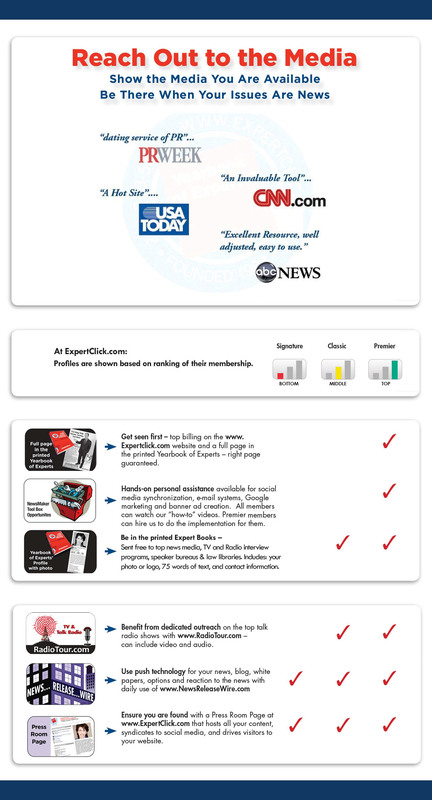 ExpertClick.com is a business referral web site where experts, speakers, and expert witnesses are found by journalists for media interviews, meeting planners for speaking engagements, and lawyers to engage for trial testimony. Be found with SEO and syndication. 2) Include your blog, Twitter, Linkedin & YouTube. 3) Plus you get a speaker bureau Platform Page. Classic and Premier memberships offer more features and higher ranking in the results. 1) Syndicated to Google News. 2) Pushed to Lexis.com -- the leading professional search resource. 3) Shown instantly on the ExpertClick front page. 4) Shown in your Press Room Page. ......Click Here To Open Sample Press Room. 5) Shown in your Speaker Bureau Platform Page. ......Click Here To Open Sample Platform Page. 6) Shown in search on all your topics. 7) Referenced by Icons in the printed & PDF Yearbook of Experts. 8) As unique search engine optimized pages. 9) At RadioTour.com for releases with audio or video. 10) With RSS feeds you can pull into your social media accounts. 1st Monthly News Release included. Additional news releases at $29 per release. Five Monthly News Releases included. Blog syndication – we pull in then push out your blog. All accounts always have our 30-Day Money-Back guarantee of success. Note: Over time our features and benefits may change. I use it to send out my email newsletter - Alan Weiss. ExpertClick.com and The Yearbook of Experts, Authorities & Spokespersons welcome bona-fide sources. ExpertClick, reserves the right to decline listings that we, in our sole opinion, are not of interest to our visitors, or inimical to the interests of our members. You'll be able to send news releases about this participant. publicly traded, please choose exchange, and enter symbol. Enter credit card for all memberships. We accept American Express, Discover Card, MasterCard, or Visa. If the 'Create Your Press Room Page' button does not work, your security settings or browser may not be compatible with our system. When you hit 'Create Your Press Room Page', we'll e-mail you a Login ID and password so you can come back and re-edit anytime.